Pili Nut Pesto Spaghetti with Chicken Barbecue. Do you wish for a different spaghetti for your Noche Buena dinner? Although the classic Pinoy spaghetti is loved by most Pinoy specially the children, more and more Pinoys are beginning to love other types of spaghetti dishes. Spaghetti with pesto sauce is one of the usual choice, and the more popular one is the pesto spaghetti with grilled chicken. Spaghetti with grilled chicken is served at almost all of the popular spaghetti and pasta restaurants. For some reasons, probably health reason(? ), most of the grilled chicken topping used by these restaurants are grilled chicken breast which most of the time grilled to almost dry and tasteless. Today I am offering my pesto spaghetti with grilled chicken version using a pesto sauce with pili nuts instead of the usual pine nuts which is not readily available, instead of the dry grilled chicken breast I used the Pinoy style chicken thighs barbecue. Of course chicken breast barbecue is also fine but I wanted to have more flavors on my chicken toppings. 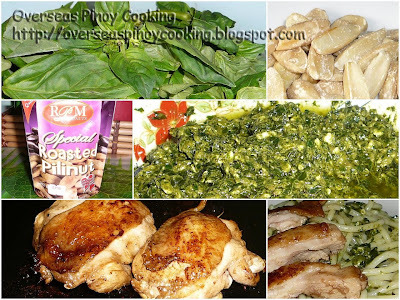 Here is how I made my “Pili Nut Pesto Spaghetti with Chicken Barbecue”. Pili nut pesto sauce: Place the basil leaves, roasted pili nuts, salt and half of the olive oil in a blender or food processor. Blend until smooth leaving with some texture. Transfer the blended mixture in a bowl or in a container with lid. Add in the parmesan cheese, mix and blend until smooth, add the remaining olive oil to keep the mixture submerge in olive oil. Keep aside until ready to use. Chicken barbecue toppings: Pan grill chicken at moderate heat for 8 to 10 minutes or until done but not overly cooked, about 2 to 3 minutes on the side with skin and the rest at the opposite side. Slice chicken into serving pieces, discard bones. To make the pesto spaghetti: Boil spaghetti as per package instructions. Drain and immediately transfer the spaghetti in a large frying pan at moderate heat. Toss in the prepared pili nut pesto until the spaghetti is fully coated with the pesto sauce. Place the spaghetti in serving plates and top with the prepared chicken barbecue toppings. Serve with more parmesan cheese garnishing as desired.